I went to Tucson, Arizona for the Gem and Mineral shows at the end of January/beginning of February on a buying trip for work, which was super interesting. It was hard not to be distracted by my personal interests, but I’m pretty disciplined, and when you walk those shows for days on end you have to focus to get through them in a timely manner. 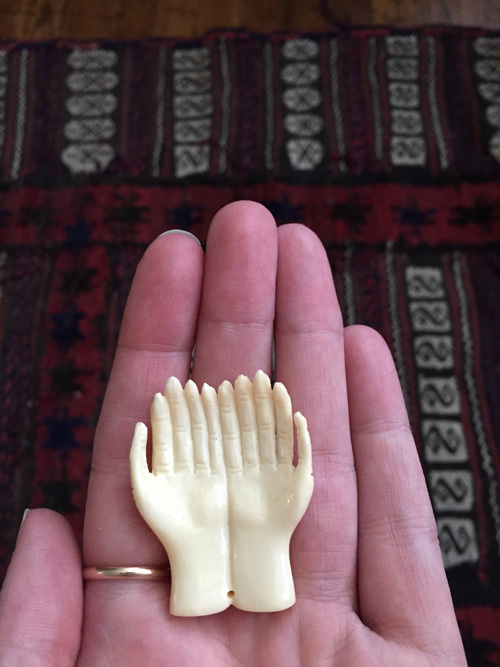 All that said, I did buy one thing… kind of a weird choice, but I saw this large carved bone pendant of open hands and had to have it. It’s slightly creepy but I’m into it. I think it belongs on a long chain, don’t you? Super nice. I wish I had one.